I’ve been MIA. I didn’t even do the listicle last week…. Even though it was my friend Bridget’s and I can’t believe I missed her listicle! Which is why you get two for the price of one today. Yessiree, cause you can’t not do the listicle when one of your favorite bloggers and very supportive internet friend comes up with it, and the one that Lisa came up with for this week is pretty cool too so there you have it, double lists. Sooooo, first ten things my parents did right thanks to Lisa of TheSprog and then ten people (more or less) alive or dead I’d like to have dinner with. Before I begin, I’d like to add that I realize I’ve been crap at blogging, and more importantly, at reading all the blogs I love the past couple of weeks, but I’ve been enjoying the summer, and having my kids with me more than I had for the almost two months since summer started. We’ve been having adventures, and sleeping in, and seeing friends, and discovering new, fun, play areas around here, we’ve been hanging out with family and friends visiting from all over, we’ve been cooking, and lazying in front of the tv, well, in a word (or three) we’ve been having fun. And who can possibly blame me for having fun? There’s so much heartache and anger and frustration and sadness and tedium in life (even when there isn’t much, it’s still too much) that we need to just stop everything and have pure, unadulterated and simple fun some of the time. So my appeal to you is: have fun. Pick a week (or even just a weekend) and stop everything else, no commitments, no guilt, no yelling, just fun, just whatever you want to do, even if it’s completely ridiculous. Having a little fun all year is great, and it’s healthy, but having a whole lot of fun, all together, an overdose of fun and joie de vivre, every once in awhile is crucial. Trust me, try it! 7. though my Dad taught me to make the perfect breakfast omelette, no mean feat. 10. they stayed together, through the hard times, and loved each other till the end. (and beyond). 1. My paternal grandparents, since they died before I was born. 2. Henry the eighth, mostly because I’m watching the Tudors right now and would really like to know what’s with the obsession with Anne Boleyn. 4. Marie Antoinette, so I could tell her to keep her freaking mouth shut and possibly get the hell out of dodge. 5. Tomàs de Torquemada, so I could tell him to just chill out a little with the inquisition please. 6. Prince William and Kate, cause they’re cute and I wonder whether they wouldn’t rather have eloped to Vegas. 7. Ryan Gosling – no explanation needed. 9. Picasso – cause he sounds like he was a good time. 10. Bridget – cause I’ll probably never make it to Alaska and I’m sure I could persuade her to come to Italy, our wine is exceptionally good! 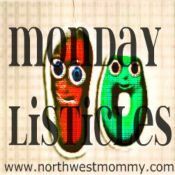 Linking up with Stasha for another great listicle monday! This entry was posted in Uncategorized and tagged meme, monday listicles, parenting by bonnybard. Bookmark the permalink. Thanks! I forgot to add that obviously I would be having dinner with #7 alone! Love your lists, but I especially love the call to take time to enjoy the kids – I’ve been feeling a little too glued to the computer lately, and I often need a reminder to be better at appreciating our time together. Thank you, I constantly have to remind myself to put the freaking iPhone down! Two list for the price of one… and both are great. I’ve been having fun and enjoying summer with my ids too the last few weeks and doing less reading and blogging. School will be here shortly and then it’ll be back to the grind. Very nice catch up work! Glad you’re having fun! A parent teaching a child to be an optimist can be the best teaching of all. I love twofers and this is a great one. Love Tudors. Just please don’t sit Marie next to Ryan please! I love the firm and unapologetic in parents. I need to work on that. Lovely list, enjoy your summer!! Oh, didn’t I mention it… Ryan was a dinner party strictly à deux! Fun or possibly a little crazy what with Henry the eighths habit of seducing then beheading or divorcing… and Torquemada being a tad too torture happy!